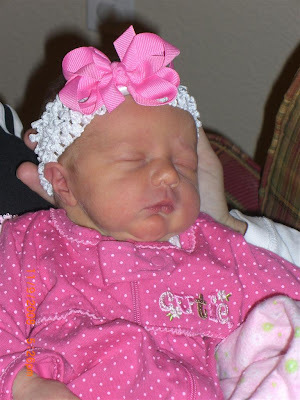 Halle Mae Smith was born on November 7th. She has been an absolute joy! We had a scheduled c-section schedules which was really nice. I loved being able to walk in fill out some paper work and then have the surgery. No worrying about when I would go into labor. The surgery went extremely well and she was born healthy and strong weighing in at 7.olbs. She seems so small and makes it really had to image just how small the twins were. The boys are doing really good with her and love to give her kisses. Also if they ever see her binky the are determined that she needs to have it. I am recovering well after a bad reaction to some pain medicine after the surgery and one other little set back I finally am starting to feel back to normal. Here are some pictures of Halle with us and with her brothers. Jackson absolutely loves babies and always wants to see Halle and give her kisses. Here we were giving Halle some tummy time and Jackson decided to join her. Preston loves Halle, though at the hospital a balloon was a little more interesting to him. She's beautiful! Will we meet her at Christmas or do we have to wait until next spring? Congratulations, we are so excited for you! Congrats! Truely a beautiful baby! She is soooo cute! Can't wait to meet her in less than a month! CONGRATS!!!! she is a cutie. Glad you are doing well. congrats guys she is beautiful. so glad that everything is better now. i understand having set backs after having baby i did with our last one also. but she is our last so don't have to worry about that again. :) cant wait to see more pics your family is beautiful. She is so cute! I can't wait to hold her. Congrats. I am so glad everything went well. Can't wait to see "your" Halle!!!!! Congrats Lindsay! She is beautiful! That's great that the boys are so helpful too!! So cute! Congratulation! I just found your blog and was so excited to learn more about your cute family. Hope to see you soon! Hey I can't believe how "CUTE" she is PS I LOVE the name "HALLE"! She is soooo beautiful!! I can't believe how perfect she looks! congratulations! i just stumbled onto your blog. Its super cute!! halle is such a doll! !